For 1926 film, see Behind the Front (film). 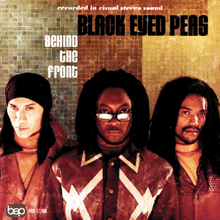 Behind the Front is the debut studio album by American hip hop group Black Eyed Peas, released on June 30, 1998. Most of the tracks were demos for the Grass Roots album, with added verses by new member Taboo. The song "Joints & Jam" appeared on the soundtrack of the movie Bulworth, where it was billed as "Joints & Jams". "Be Free" also features in the film She's All That. On the back cover, "Skit 3" is listed after "Duet", when it actually appears after "Communication". This was their only studio album to be released in a Parental Advisory version and an Edited version. On the edited version's back cover, "Skit 3" is properly listed after "Communication". In 1997, a music video for the song "Head Bobs" was filmed and finished, however, the band decided to not release the song as a single. Around the same time a music video for the song "Fallin' Up" was also created, however, was decided that the album's first official single would be "Joints & Jam", with its respective music video released. A similar video to "Joints & Jam" was filmed for the song "What It Is", but like "Head Bobs" and "Fallin Up", the song wasn't an official single. The last music video to be released from the album was "Karma", the album's second and final official single. All five music videos were included on the DVD Behind the Bridge to Elephunk. "Fallin' Up" contains a sample from "Comanche" by Jorge Ben. "Clap Your Hands" contains a sample from "Handclapping Song" by The Meters and "Tenement Yard" by Jacob Miller. "Joints & Jam" contains a sample from "Grease" by Frankie Valli and "Love Till the End of Time" by Paulinho da Costa. "The Way U Make Me Feel" contains a sample from "Here We Go (Live at the Funhouse)" by Run-DMC and "Something in the Way (You Make Me Feel)" by Stephanie Mills. "Karma" contains a sample from "El Raton" by Cheo Feliciano and The Joe Cuba Sextet and "One Way or Another" by Blondie. "Be Free" contains a sample from "White Horse" by Laid Back. "Say Goodbye" contains a sample from "Heaven and Hell Is on Earth" by 20th Century Steel Band. "What It Is" contains a sample from "Funkin' for Jamaica (N.Y.)" by Tom Browne. "A8" contains a sample from "O Homem Da Gravata Florida" by Jorge Ben. "Positivity" contains a sample from "Cinco Minutos" by Jorge Ben. ↑ "Joints & Jam [Vinyl]: Black Eyed Peas: Music". Amazon.com. Retrieved 2012-02-08. ↑ "Karma [Vinyl]: Black Eyed Peas: Music". Amazon.com. Retrieved 2012-02-08. ↑ "iTunes - Music - Behind the Front by The Black Eyed Peas". Itunes.apple.com. 1998-06-29. Retrieved 2012-02-08.